In 1935, the English writer Stephen Spender wrote that the historical pressures of his era should "turn the reader's and writer's attention outwards from himself to the world." Combining historical, formalist, and archival approaches, Thomas S. Davis examines late modernism's decisive turn toward everyday life, locating in the heightened scrutiny of details, textures, and experiences an intimate attempt to conceptualize geopolitical disorder. 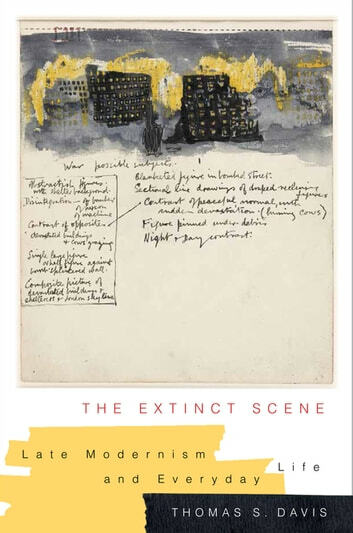 The Extinct Scene reads a range of mid-century texts, films, and phenomena that reflect the decline of the British Empire and seismic shifts in the global political order. Davis follows the rise of documentary film culture and the British Documentary Film Movement, especially the work of John Grierson, Humphrey Jennings, and Basil Wright. He then considers the influence of late modernist periodical culture on social attitudes and customs, and presents original analyses of novels by Virginia Woolf, Christopher Isherwood, and Colin MacInnes; the interwar travel narratives of W. H. Auden, Christopher Isherwood, and George Orwell; the wartime gothic fiction of Elizabeth Bowen; the poetry of H. D.; the sketches of Henry Moore; and the postimperial Anglophone Caribbean works of Vic Reid, Sam Selvon, and George Lamming. By considering this group of writers and artists, Davis recasts late modernism as an art of scale: by detailing the particulars of everyday life, these figures could better project large-scale geopolitical events and crises.